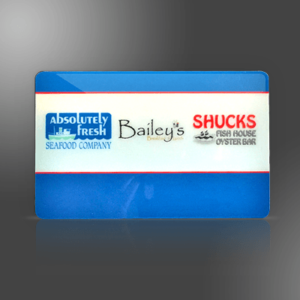 Our Gift Cards can be used at Shucks, Bailey's Dundee Dell and Absolutely Fresh Seafood Market. Order online and we'll ship it for you, free of charge! PLEASE NOTE: ALL GIFT CARD ORDERS WILL BE SENT VIA U.S. POSTAL SERVICE. PLEASE EXPECT 5 TO 6 DAYS FROM TIME OF ORDER UNTIL DELIVERY.